LOGAN — Local First District Judge, Kevin Allen has announced he will be stepping down from the bench after serving for over 11 years. He reportedly submitted his notice this week to Utah Supreme Court Chief Justice Matthew Durrant and Utah Governor Gary Herbert. 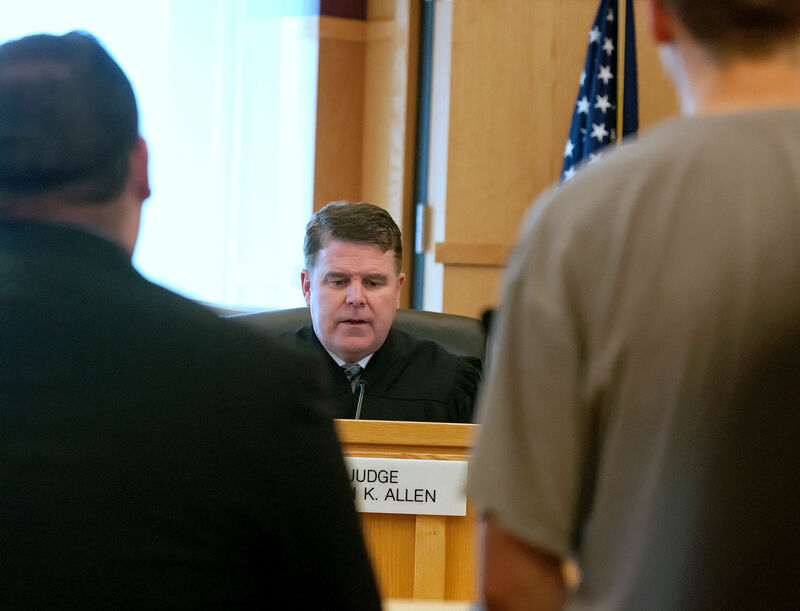 Judge Allen has overseen cases in Cache, Rich, and Box Elder Counties. He has presided over several high-profile cases, including the attempted aggravated murder trial of Deserae Turner’s shooter, Colter Peterson. Judge Allen was appointed to the First District bench in 2008 by then Governor Jon M. Huntsman. He is a native of Cache County, and received his undergraduate degree from Brigham Young University. He later received his law degree from the University of Oklahoma. Colter Peterson makes initial appearance before Judge Kevin K. Allen in 1st District Court on Monday. Peterson has been charged with attempted aggravated murder in the shooting of Deserae Turner (Eli Lucero/Court Pool). While in law school, Judge Allen was commissioned as an officer in the United States Navy and after graduation, served in the JAG Corp where he eventually became the lead prosecutor for the Northeast Command and the Tax Officer for the European and Southwest Asia Command. Upon leaving active duty as a Lieutenant Commander, he returned to Logan and practiced law primarily in civil matters. Judge Allen established and presides over the First District Mental Health Court in Logan and has been a strong proponent within the judiciary of Mental Health Courts and other judicial intervention programs for the mentally ill. Additionally, he is a co-founder of the National Mental Health Court Summit held in Park City. He served as a member of the Utah Sentencing Commission and as a member of the Utah Board of District Court Judges where he eventually became Chair. He currently serves as a member of the Utah Judicial Council, the governing board of the Utah Judiciary. Throughout his 11 years, Judge Allen would often take time in court to speak with youth groups. He also visited local schools to speak to students. Judge Allen will remain on the bench until August, after which Governor Herbert will nominate a new judge with confirmation by the Utah State Senate.